Does your commitment to strategic planning quench the Holy Spirit? 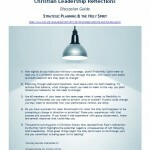 Should a Christian ministry do strategic planning at all? A brief study of Paul’s second missionary trip will provide the answer. Paul’s first missionary trip was very fruitful due to the many churches he planted in Asia. Good leadership and strategic planning would dictate a return trip to ensure the churches were growing as they should and to further strengthen them, and that is what Paul intended to do (Acts 15:36). He left Antioch after his church commended him to God with this mission in mind (v. 40). Significantly, although the Holy Spirit gave specific instructions for the first trip, there is no mention that Paul received any direction from the Holy Spirit at all for this trip. The way Luke tells the story, any reader would think that Paul’s plans are plain good sense and are just what they would have done if they had been in his sandals. There is no foreshadowing of trouble at all. Luke could have written, “But he failed to consult the Lord” to alert his readers to what was to come, but he didn’t. Luke wanted us to experience the Holy Spirit pretty much as Paul did, so that the lesson would be all the more forceful for us today. After visiting the churches Paul tries to venture further into Asia, but each time discerns the Spirit withholding his permission. The frustration of Paul’s Asian plans mounts until finally, in a dramatic vision, the Spirit reveals to Paul what his mission trip is really about and calls him to Macedonia in Europe. By blocking Paul from going deeper into Asia, the Holy Spirit was gradually corralling him into a port city from which he could easily embark on a ship to the place he wanted Paul to go. At least this time God used a ship to transport Paul’s team and not, as he did with Jonah, a great fish! But then, Paul didn’t run from his call. The narrator shows a keen interest in the dialogue between human purpose and divine purpose, indicating that Jesus’ witnesses, too, must patiently endure the frustration of their own plans in order to discover the opportunity that God holds open. This opportunity may not be the next logical step by human calculation. The Gospel of Luke shows the Holy Spirit guiding Jesus at every step of the way and he continues to guide the church in Acts. God interrupting human plans is a central theme in Acts. Just as the Spirit interrupted Paul’s planned visits to Asia, so he interrupted Peter’s planned visits to the Jewish church in diaspora (Acts 10:10-20) and directed and even moved Philip to the places he needed him (Acts 8:26-40). God’s plans were not what the apostles had in mind. But to the benefit of the entire church throughout the ages since, the apostles trashed their own plans and and followed God. Later the other apostles supported the new dimensions of mission introduced by Peter and Paul as they deviated from their own plans and accepted God’s plans (Acts 11 and 15). Luke wants his readers to know that when the Spirit gave clear direction to Paul to start out on an entirely new mission, the conversion of Europe (a mission that was not at all contemplated in Antioch and that was completely outside the scope of his intended journey), Paul immediately followed the Spirit’s direction, just as we should today. Many people regard Acts simply as a history book. It does tell the history of the early church, and Luke did intend to bolster our faith by informing us of its origins (Luke 1:1), but that’s not the only reason why Luke wrote it. Luke tells of the origin of our faith, and Acts is a manual for how the church should faithfully go about its work as a Spirit-led church. Its purpose is to encourage and inspire us as we continue to fulfill the church’s mission today. Paul’s team wasted no time in getting on board with the new mission. Luke records in 16:10 that “After Paul had seen the vision, we got ready at once to leave for Macedonia, concluding that God had called us to preach the gospel to them.” And thus the Western church was born! We need to follow God and not a plan. I have had to learn this lesson in my own life. As a corporate leadership trainer, I was an enthusiastic supporter of strategic planning, goal setting and performance reviews based on measurable objectives. My enthusiasm for planning changed, however, when I received my own very unexpected call ‘out of the blue’ from God to prepare for something new. Believe, me, no plan of mine had that call from God in it!! The Spirit did not reveal what the preparation was for, and I was challenged to trust God, give up my work and become a full-time student again in mid-life without knowing what the goal was, where I was headed, or what God had in mind. All I knew was I had to go to seminary. The Spirit reminded me that, “If my ways are not your ways, and if my thoughts are so much higher than yours that you can’t even conceive the depth and breadth of my thoughts, then the best your puny little plans can do is frustrate what I want to do through you. Stop planning and let me lead!” (I was, shall we say, overly planful at the time!) The image of me being blindfolded and holding on to God’s shirtsleeve was very vivid and God’s intent was quite clear: “When I take a step, you take a step.” And that is how I have lived my life ever since. So back to strategic planning. I’m documenting in real time the strategic review I’m doing of CCCC, and you can follow that on this blog. The key point about strategic planning for Christian ministry is that you can’t plan your way into the great and marvelous things God wants to do through you or your ministry. (I wrote a tongue-in-cheek post asking “What if the apostles had tried to write a strategic plan?”) I do not want my commitment to any plan to limit what God might want to do. The logic of a plan may say to do one thing but the great deeds of history were often not very logical, they were daring. We as Christian leaders need to leave room for God to do what only he, in his power, can do. I agree that planning is useful and much good can come from it. Paul’s planned second missionary journey led him to Timothy as an addition to his team, strengthened the churches that had been planted and added many converts in those areas (Acts 16:1-5). Strategic planning does get results. It just can’t, on its own, get all the results that God desires to give. Any planning process used in Christian ministry must honour the leadership of the Holy Spirit. Commit first to the mission God gave your ministry. When God leads you in a different way than your plan lays out, follow God, not the plan. I know firsthand God’s ability to orchestrate things so you end up doing something far more significant than you ever could have planned for on your own. Just before God told me to withdraw my job applications, I had submitted my resume to CCCC. Both my wife and my pastor saw the job ad and encouraged me to apply because they thought I was a perfect fit for the job. When I was told to withdraw my applications, I had not yet had any response from CCCC. The Spirit let me know that I should leave this one application alone, and simply respond if they should call (which, obviously, they did). The Spirit said, “Just sit back and watch what I can do.” The rest is history. I do plan, but I only ever regard my plans as default plans. Plans that I will follow should nothing better come up. I do my best to stay sensitive and receptive to the Spirit’s guidance each and every day. Thank you so much!! Your article, testimony, and podcast spoke directly into my life and circumstances!! God bless you for being such a wonderful yielded vessel of Christ Jesus. Thank you Khristy. May you see everything God has called you to do fulfilled beyond your expectations!! Thanks for this encouraging article. Currently I’m working on my dissertation and I’m writing about Strategic Planning in ministry. Your article has given me a broader understanding on the subject matter. God bless you. Thank you Pastor Zakayo. Glad to be of help! May you do well with the dissertation.